President of India Pranab Mukherjee has given his nod to the Telangana Bill which is likely to be tabled in Parliament on Tuesday. Home Ministry officials said on Monday that the Andhra Pradesh Reorganisation Bill, which was approved by the Union Cabinet but rejected by the state Aseembly, has been sent back to the Home Ministry with the Presidential approval. The Bill is likely to be introdued in Rajya Sabha tomorrow, an official said. 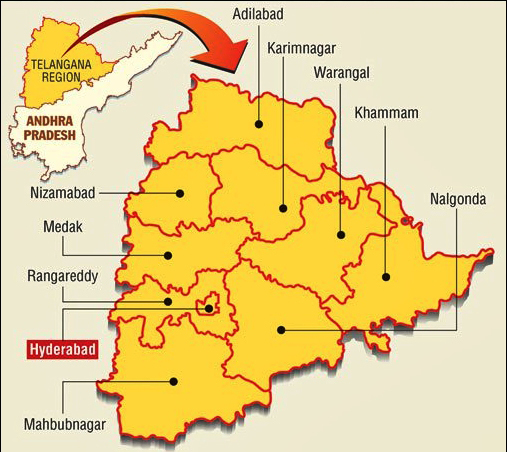 The Union Cabinet had on Friday approved the draft bill for creation of Telangana by bifurcating Andhra Pradesh, notwithstanding the state Assembly’s rejection of the legislation. By introducing the bill in Rajya Sabha, the government apparently wants to keep it alive even after dissolution of Lok Sabha. Bills introduced in the Upper House and not passed by it remain in the ‘live register’. The controversial bill will be presented in the form it was sent to the Andhra Pradesh Assembly and the government is expected to move 32 amendments when it is taken up for consideration, sources said. The proposed legislation does not provide for grant of Union Territory status to Hyderabad despite demands to that effect but the government will announce a special package for Rayalaseema and north coastal Andhra to address concerns of the people there. The Cabinet cleared the Andhra Pradesh Reorganisation Bill after a special marathon meeting which was followed by a meeting of the Congress Core Group headed by party President Sonia Gandhi. With the current session of the 15th Lok Sabha being the last ahead of elections, the government wants that the bill be taken up for consideration and passage during the session. The government decided to go ahead with the bill despite the Andhra Pradesh Assembly rejecting it, with Congress Chief Minister Kiran Kumar Reddy leading the opposition to the proposed bifurcation. Opinion Poll, Who Will win the Lok Sabha Election ?